What a year it’s been! When they say hard work pays off? Believe it! I’ve been on cloud 9 this whole year. Not entirely true as I’ve certainly had my share of challenges in 2017 but since the start of the peak training period of the Marathon Des Sables in January I was on a high. I can’t even say on a runner’s high as I was still recovering from an ankle injury and training comprised power walking and hiking with a 10kg bag so more like a walker’s high? LOL! Every year I take on a big endurance event, something that I know will require absolute focus and 100% effort on my part if I want to succeed. Every year I raise the bar and enter a “so out of your league” type of race. This year was no exception. 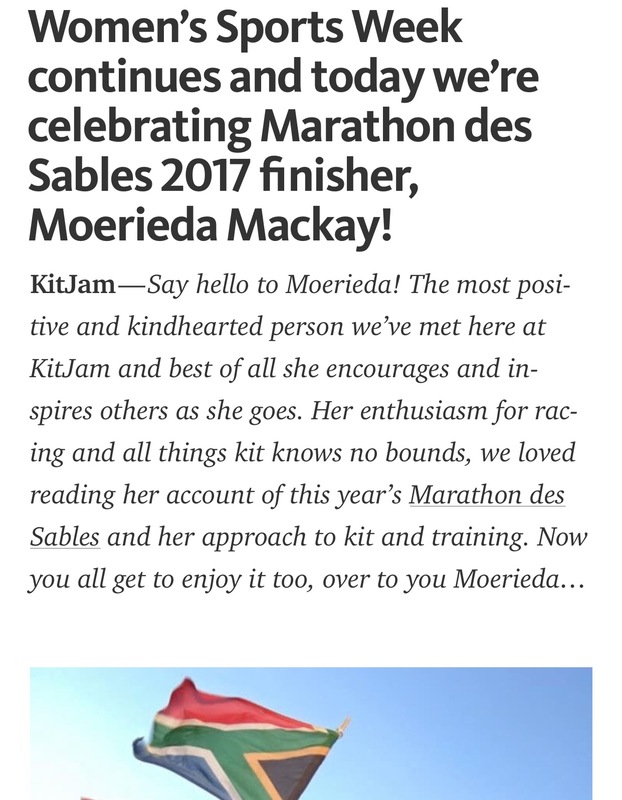 I had the very famous Marathon Des Sables as the only race on my running schedule. It was a bucket list race that I have been dreaming about doing for a very long time. The last 4 years training and racing was all part of a plan to build myself physically and mentally to survive (and enjoy) this grueling 250km footrace through the inhospitable yet beautiful Sahara Desert in Morocco. And every year I am blessed with so many beautiful and amazing people supporting me in my crazy adventures. I am often ask how I do it? How do I run all these races and having a family to support and a demanding job? What keeps me going and how do I stay so motivated? 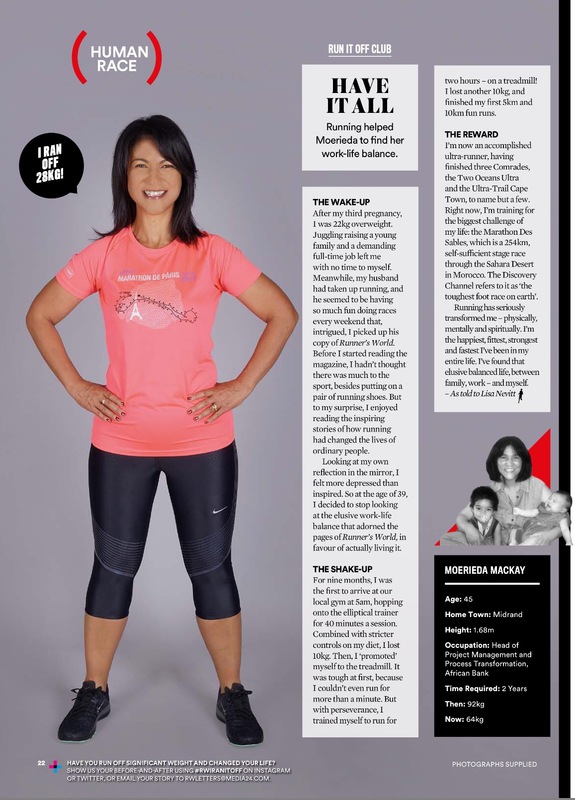 The secret (apart from the hard work obviously… absolutely no way around that!!) is to surround yourself with good people. People that support you. What does that mean? People that love to see you thrive as much as you love pushing your limits. People that challenges you in a positive and constructive way. People that teaches you. People that builds you. People that are patient with you and let you just be (for a while). People that makes you look at things differently. People that make you say “OK, I’ll give that another go!” People that understand that running is a big part of your life and it actually makes you happy. People that understand how much of yourself you are investing in your silly dreams. People that celebrate with you when you achieve your goals and dreams. People that make you feel like real running celebrity and allows you to dream even bigger! And this year was certainly no exception! The many articles I was featured alone is prove of how widely I am supported. I feel blessed and grateful for all the amazing people I have in my life even strangers leaving comments and words of support and encouragement of my social media pages. I still can’t fully describe my feelings when I crossed the finish line of the Marathon Des Sables. It was the hardest thing I have done in my life and at the same time it was the most amazing adventure… a dream come true. When dreams come true… no words to describe my #mds2017 adventure! 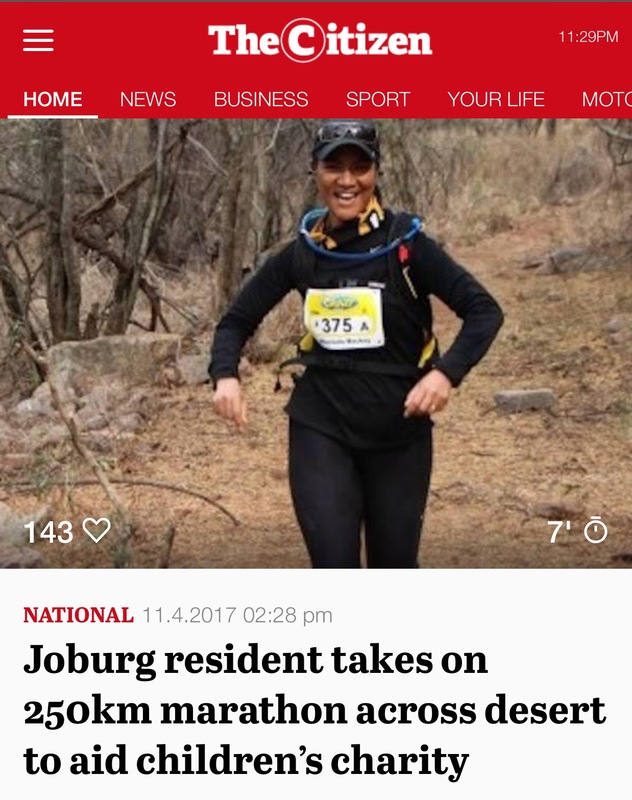 This post is really to say thank you to EVERYONE (not just the few mentioned below) that supported me in my MDS journey and made my 2017 AMAZING!! Cindi King and Yvonne Skerrit – My special friends!! Cindi for always checking in with me and so passionately supporting me in all my adventures. Yvonne for going out of her way to get some of my kit for the race from the UK (what a mission!). Thank you… love you both! My Twitter Tribe – My #earthathon running buddies. 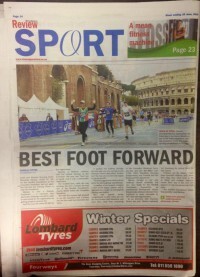 It is great being part of a very supportive running community. You guys all rock and make training fun! My Family – You guys are simply the best. I can’t wait for one… or all of you to join me on an ultra-adventure one day!! Without a doubt my highlight of 2017 and what I am most proud of achieving this year is starting my own business (Stride Consultancy Services). Yip, all running inspired!! After spending years in the consulting and corporate world I have finally decided to take that leap of faith and pursue my lifelong dream of starting my own company (build an empire) and be my own boss! Stride is a challenger management consultancy specializing in Strategy, Digital Transformation and Innovation. It is still early stages but I have never been this excited to see what the future holds! Earlier this year I did my first Wolf Pack Trail Challenge (WPTC) and can honestly say I have never had so much fun on a training run as with WPC. This is the ultimate in hill training for anyone not living in Cape Town or close to the mountains or who don’t want to spend hundreds or thousands of rands to claim 1500m of elevation gain in one go! What makes this event so extra special? The WPTC is not an official race but rather a seriously challenging hill training session that even draw elite trail runners, think the likes of Bennie Roux, Thabang Madiba and a whole host of other speed demons who think they can beat these two to the challenge… ultimately giving it that race like feel! I loved it. It’s like training with the elite, seeing them in action and yes…seeing them working really hard and…suffer! Don’t for one moment think hills come easy, not even for the elite. But this is just some of the reasons I’ve enjoyed the WPC. I just love seeing people working hard and pushing limits; so inspiring… makes me believe I can do it to! 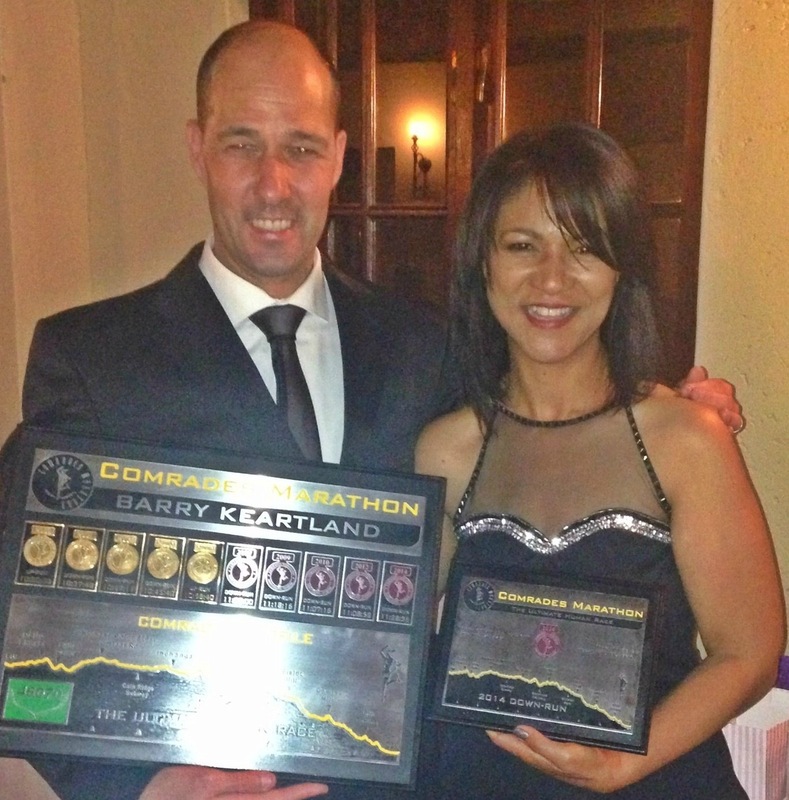 However what makes this event extra special is the amazing spirit and camaraderie of all the passionate trail runners. I’ve never had so much fun with a group of of strangers. Seriously…the power of social media…aka Facebook and Twitter. Lol! Training Run 2weeks before the event. It was deemed appropriate to actually train for WPTC… Lol! “I was training in the Magalieberg one day and discovered the steep climb at the back of the mountain. I thought I would do 2 or three repeats because it was so steep. I manage to do four and told myself to try one more. I made it and recorded it in my logbook as a five pack. That sounded stupid and it was one short of a six pack. The suffering reminded me of a piece I wrote on fighting the wolf (injury) which to me is the worst suffering of all. The wolf to me epitomizes the mental and physical toughness we need to survive”. I couldn’t keep this to myself and I decided to invite a few trail runners to do it with me. I did the first one in 2014 ( only two completed the challenge). Last year (2015) 17 candidates completed the challenge. So far this year ( January 2016) we have 57 candidates for Saturday’s “Wolf Pack”. that’s why we have the theme of ancient warrior running in the mountains. …when you focus and work hard… this is all you see! Honestly didn’t know what that meant… until about the 3rd rep… Lol! Beautiful views at the top! THE WOLFMAN (Henk Mulder) showing off the special finishers medallion… it’s huge and beautiful! Runners being brief about the challenge and where to find their medallions on their way back. It’s all in the detail. How special is this? Off course I was out of breath within the first 1km! I… came… for… hill… training! Beautiful day with beautiful views…. I felt like a real warrior woman… LOL! Couldn’t stop staring at my medal! When you get an ice cold Coke from the Wolfman on your last rep… priceless! A massive THANK YOU to the Wolfman for sharing his trails and passion for running with us, the beautiful medals, my ice cold can of Coke on my last rep and for bringing together a great group of passionate runners to share this event with. The next event will be on the 2nd of July 2016. Perfect timing as I’ve just kicked off training for my 2016 goal race… the 100km Salomon Skyrun; more about this in another post. Those following my blog know that I’ve become completely obsessed with running in the desert. I cannot explain why I have this dire need to run hundreds of kilometres over multiple days carrying my own food and all the equipment I would need to survive (no doubt)…a gruelling experience! Over the past 18 months I’ve certainly done my fair share of research into the sport of extreme multi-stage endurance racing. 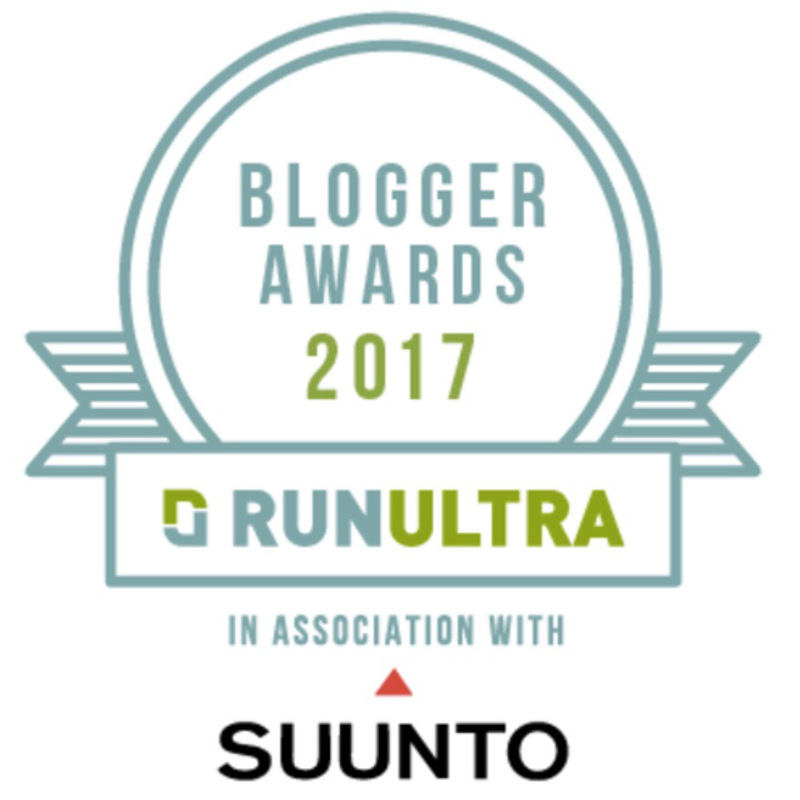 I’ve crawled the web and probably consumed every piece of information relating to extreme, ultratrail and multi-stage endurance events; almost an expert on the topic just need to do a race (LOL)! The more I learn about extreme ultra racing the more it fascinates me. Why would anyone of right mind run those silly distances, go through so much pain….most of all spend so much money to do it? Let’s face it, extreme sports are not cheap. What’s wrong with just working on the 10K and mastering the marathon? Yes, obviously you need to train for the event but unless you’re a front runner you will likely walk half (if not more) of the race. Right now I don’t see myself running with a 9kg backpack over sand dunes and dried up riverbeds with temperatures above 40 degrees Celsius, carrying 3 litres of water! This post is a reblog of Adrian May’s Marathon des Sables 2014 race report. Adrian has run the MdS twice (2012 and 2014) in aid of Hope for Children, a UK based charity which works in 8 countries around the world to help children reach their full potential. When I saw a picture of Adrian’s shoes on Twitter after he completed the 2014 MdS I laughed for days (still am)! Yes, feet are important but is this what it comes down to? Lots of learnings and insights for me in Adrian’s race report. Hopefully when my turn comes I will be ready and strong to push through whatever gets thrown my way! (as originally posted by Adrian May aka @MdS_Runner) It’s 02:00 in the morning on day 4 of the Marathon des Sable. I’ve been on my feet and moving since 09:00 the previous morning. Oh and by the way I’m carrying everything I need for a week in the desert, along with circa 1,000 other competitors, and the temperature has been a pretty constant 46 degrees Celsius during the days. This stage is 81.5km (over 50 miles) and I’ve already covered over 100 km in the preceding 3 days. The first 10km of today was lovely and flat and then we hit a 2km track up a Jebel (think massive sand dune with rocks on top) with an average slope of 12% and for the last 0.5km at 30% which means scrabbling up rocks on our hands and knees. The Jebel was some 15 hours ago and since then the course has gone up and down valleys, hills, dune fields and god only knows what – I’ve completely lost the plot. My feet are killing me. Every step is like walking on shards of glass. The last 20 kms is on soft sand in the dark; all alone with glow sticks on poles every couple of kilomters and the only light form my depleting head torch. I’ve really had enough. I could very easily just lie down on the sand in the dark and simply give up. All of a sudden I hear “Hello tenty”! It’s Chris – one of my tent mates full of the joys of spring catching me up, although as I later discover he’s far from feeling that himself. But for 20 minutes he shouts out encouragement to me and I suspect to himself but it works! I pick up my pace and we both make renewed progress with a power walk across this horrible terrain. Some lights glowing faintly in the distance! Chris suddenly announces that he can see tents around us. He gets more and more excited … “Only 500m to go mate” he shouts and then whispers ….”I think the officials have turned their head torches off and are going to jump out and surprise us when we arrive at the finish!” Why they would do this to us is beyond me and obviously to him to but I go along with it after all he could be right … only 500m to go!!! 5km and one hour later we arrive at the finish and poor Chris needed to head directly to the clinic for some “help”. But we made it and will never forget the horrors of that night. Welcome to life in the Marathon des Sables. The MdS. It ruins your legs, trashes your feet but more scarily it thoroughly messes with your head. Disorientation, confusion, massive highs and horrendous lows are common place. Everyone will suffer this to a greater or lesser extent – and learn that mental strength is key to finishing the toughest foot race in the world. The days leading up to the start should be labelled as eerily coincidental. We wanted to form our 8 person tent team in the days leading up to the event as we knew we were going straight to the desert from the airport. We already had a core of 4 BP ers – Rob, Andy, Gerrit and myself. There was another competitor also with the surname of May; called Tom (my son’s name) also running for HOPE – such a coincidence that I felt he should be invited to join and he brought Chris who’s brother works for Castrol. Keeping up with me? Peter and Matthew were persuaded to join at the airport. Even more bizarre was a colleague at BP who contacted me to say her sister and father were also running this – could I look out for them. Sure, in a field of 1,000 runners … no problem. I contacted Tom at the airport to learn he was sitting at a table in a restaurant with Laura and Len; the daughter and Father. So tent team 110 formed and Laura and Len became an extended tent team family that we could always go and cadge stuff from if needed! Since this morning we spent hours in queues. Queued for water, for hexamine tablets, breakfast, to get our passports back, for lunch and now for registration. Each time standing in the sun. It’s hot! The main job this morning was final packing so we have all we need in our running bag and the rest gets sent back to storage until the end. The last 3 months has been spent on agonising what should be carried and what gets left behind. The final 2 hours sorting the last bits was awful – this was it. Final bag weight is 8.3 kg but will be up to 10 kg with water and distress flare. After the day of queues the tent group went for a walk down to the start and on for the first km. The dune field we know we need to cross lies across our path with the massive dunes glowing orange in the sunlight. Tomorrow will start with a flat couple of km followed by the 12km through this dune field, then the rest of the route appears to be along a river bed but a number of hills in involved. Hard to tell from the route book. Big panic this eve as I couldn’t find my head torch but later found at the bottom of Tom’s back pack. An easy mistake as all our stuff tends to end in a big pile at the back of the tent. I should have shut up and he could have carried it for me! No one was clear on what time it is. Every official we asked seem to think it was either same as UK or others one hour earlier. All became clear at the afternoon briefing. Today we are on Morocco time which is the same as UK. Tonight we create our own time zone and go back one hour! Bizarre or what ??!! 44 nationalities taking part. The Ukrainians got a big cheer. Youngest is 16 and the oldest 76; so despite some peoples comments I’m not the oldest contestant! Weird demonstration of how to use the toilet facilities which peaked with the suggestion of putting a small stone in the bottom of the plastic bag to prevent unfortunate incidents if it gets windy … sorry too much information. The food provided today has been fabulous and provided for us – I’ve eaten well so won’t be hungry tomorrow! We’ve learnt that some official starting the race tomorrow so start put back to 10 UK time. Will be nicely warming up by then! Best described as dunes, dunes and dunes!! Prior to the start we went through the usual process of creating the numbers for the year of the event. In this case 29…9th edition. Helicopters flying over to take photos but it took forever to get 1,000 + people organised! Usual excitement at the start (1) Lots of noise (2) Helicopters flying low over our head and (3) loud music. We start to fall into a routine; safety briefings etc, sing happy birthday to however many people have a birthday, being asked to do a group dance to Happy (from despicable me 2) (!!) and then as the final countdown starts the volume ramps up with “High way to Hell”. Helicopters flying so low over our heads as camera crews lean out. The race starts with a flat run of 2.2 km until the dune field. Turns out it is the tallest dune field in Morocco! 12 hard kms at the start – our bags are at their heaviest! No time to settle down but straight in. CP1 we were given another 3 litres of water which was a pain to carry. Temperatures well over 40 deg c at this stage. 12km on the flat and then back into another dune field for another 6.5 km! The sand was draining. It took me approx 7 hours and 15 mins. During the last dune field there was someone collapsed in the sand asking for a doctor. A little way later 3 people in a similar state next to an officials car. So it was clear the staff were having their hands full. A combination of heat, dunes and the amount of water we had to carry made this a tough start. 41 km – 1 km short of a marathon (on day 2, when our bags are still heavy!!) and once again it was very hot and lots of sand. Really tough stage. Temperature reached 46 degrees. Most passed in a bit of a blur. Up to CP1 I ran most of the way but for some reason CP1 to CP2 was just tough. Struggled to even walk fast. Finally stopped to recoup which included a handful of salt tablets and something to eat. Felt much better and kept on to CP2 where I ate and was set up to do some power walking to CP3. This was at the foot of a Jebel where we had a 15 degree climb to the top….and it was sand. This was at 34km. Managed to run/walk to the end…saw the finish and managed a fast run for last 100m and overtook a number of people to move up the board. Finished in 532th position. Got back to tent and knew before I took my shoes off that I had problems with my feet. I could feel the hot spots. Long story short I ended up in Doc Trotters with 4 blisters on right foot and 3 on left. As always the level of care was incredible. It took over an hour for the treatment which was made up of puncturing the blister, injecting with iodine (very painful!) and then bandaging up. Both feet now resemble a mummies!! Incredibly qualified people treating us. The first doctor is head of intensive care for a hospital in Monaco. He started treating me but was asked by the head doctor to go and help one of three patients in the intensive care section of the clinic here. They were all suffering with heat stroke and this individual had to be airlifted out shortly after. Learnt later that this person had a temperature of 42 degrees and they managed to reduce with a drop but it later climbed again. He was taken to Casa Blanca and all our thoughts are with him. The second doctor leads a trauma unit in Paris for anyone involved in a serious accident. It’s very humbling to have such well qualified and knowledgeable people providing very basic but very gentle care to such a high standard. All 57 medical staff are volunteers. They are also very noticeable at each of the check points. Making conscious efforts to engage people in conversation and looking very deeply into their eyes just to check we are OK. So, we are well looked after. Day 3 is over and I’m back in Doc Trotters waiting for treatment. Blisters have multiplied so I’ve had to clean my feet, remove dressings and wait. Another hard day. So much sand! The worst part was a Jebel at 17km with a 12% climb for over a km. It was all over loose rocks so at times on hands and knees. Breath taking views from the top. Once again the time up to the first checkpoint went well and fast…maybe too fast. I’m finding I’m fading around lunch time. Not enough calories in my bag (because of weight) so I’m trying to eat an energy bar or similar to gain calories. Back into camp there is a standard routine. Collect 3 x 1.5 litres of water. Back to my tent and I immediately make a recovery shake. Walk 100m from the tents and strip off and clean up with a bottle of water I hold over my head. Modesty goes out of the window here! Then up to a couple of hours in Doc Trotters before going back to the tent for dinner. And that is honestly disgusting. I really have to force myself to eat it. Once again I’ve only eaten half so I’m not getting calories in. After dinner I wander up to the finish to see the last runners come in. Then to the results board to see how I did. Back to the tent and in bed by 9 ish and then sleep through to approx 530. I have to say my sleeping mat sounds like a crisp packet and makes a racket every time I turn over! Keeps both me and my tent mates awake … after a couple of nights I gave up on it and sleep on the rug on the desert floor. The postman comes round about 7. Thank you for your messages they really do help. It’s a funny sort of bubble we live in here and the outside world contact makes me feel connected. So …. The outcome from Doc Trotters is every toe on my left foot is bandaged up plus my heel plus a swollen ankle. The right foot is better…only 3 toes and the heel. Tent mate Peter is complaining about his knee. I hope it recovers overnight…. the big day tomorrow. 81.5 Km. I think I’ll need to make holes in my shoes to get my feet in……. !! And so to the day I introduced at the beginning of this collection of memories. I’ve taken my notes direct from my blog .. written hours after I finished this stage in day 5 which is the rest day. It reflects how I felt. If I ever show the slightest inclination of doing an event like this then please stop me, shoot me if you must. In Doc Trotters again and my feet resemble a steak. Yesterday was the double marathon. I completed it in 17 hours. Last time I used the word brutal to describe the race. This time it’s worse. I honestly don’t know what word to describe what I went through yesterday. A good friend wrote on my tyvek suite “even when you have gone as far as you can and you are staring the spectre of self-doubt, you can find a bit more strength deep inside you if you look close enough”. I kept thinking of this and thinking firstly how much deeper I needed to dig and secondly how many people I would let down if I don’t keep pushing myself. The number of times I was literally in tears with the pain and frustration. I can honestly say I gave it everything and there was nothing left when I got in at 03:00. That all I wanted to do in the last three sectors was lie down in the sand in the dark and just give up. But I made it. God only knows how I will do a marathon tomorrow…but that is a worry for tomorrow. Actually that’s a worry after I’ve seen Doc Trotters and they comment on my feet! That day started off badly with tent mate Peter announcing his knee was so bad that he couldn’t walk let alone run so he was withdrawing. A tough decision and all respect to him for making it. 81.5 km – 6 check points and we’d already run over 100km the preceding 3 days. I had decided my strategy was to power walk this stage. We had a Jebel at 9.7 km described as a difficult ascent with 12% average slope and 30 % for last 500m. 2 km in total. Think very very large sand dune with rocky parts where we were literally scrambling on our hands and feet. I don’t like heights and it was ridiculous the height that we were scrambling along. The organisers at least provided a rope hand rail for us to hang on to. I kept having the fear that I would topple backwards with the weight of the back pack. It was all single file and on a number of times people stopped to take photos which caused delay. CP2 was where the top runners came past. The top 50 men and 5 women are held back 4 hours after we start. Seeing them shoot past was rewarding but also incredibly emotional. Half way to check point 3 things went pair shaped for me. I wear custom orthotics in my shoes as I’m very flat footed and this causes more pressure on my ankle. However yesterday I chose to fit ordinary orthotics as they take up less space in my shoe. Big mistake. I could feel my ankle getting more painful. I had to stop and change the orthotics over. Unfortunately the damage was already done. My ankle was swollen and harder than ever to get my foot in the shoe. I then started self-medicating alternating paracetamol and ibuprofen to mask the pain. I can honestly say I wasn’t that successful. It felt like I was running on shards of glass. Last time I broke the day down by sleeping for a few hours on the course. I was determined to go straight through this time but by CP5 I was feeling so nauseous I couldn’t even drink my water. A doctor gave me a tablet to help. CP5 to 6 was a nightmare. It was on soft sand in the dark and it was hard to keep up any progress. After CP6 I suddenly heard the words from behind … “Hello tenty ! !” It was Chris and we were both in a dark place. He was fabulous though…kept shouting out encouragement and I can honestly say I’m not sure I would have finished without him. He did decide at one point the we only had 500m until the finish; distances are hard to judge at night in the desert and it was more than 5km. With less than a km to go Chris was just not feeling good. He stopped to find his thermal blanket and told me to go on. I said I’d wait for him at the finish. There were about 16 people behind us. 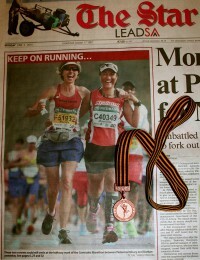 One a woman who I’d preciously challenged to sprint for the finish line. She announced we should all do this…so head down and goodness where I got the energy but I got in ahead of them all. After all that hard work I was not losing more places!!! After the lovely cup of tea provided Chris headed for Doc Trotters and I went back to the tent. 3 back already and those had all done incredible times. Got straight in my bag…but couldn’t sleep with the throbbing from my ankles. I’m Out of Doc Trotters now. Three doctors spent over 2 hours on my feet and now I can stand upright!! Been put on antibiotics and given some very strong painkillers so feel like I’m flying right now. I’ve won the prize for the worst feet (no prize !!) but had lots of photos taken of them by the medical team. So now a time to relax, eat and sleep. Another marathon tomorrow and with all the TLC I’ve received today the least I can do is go out there and compete !! And the wheels come off my dream to finish in the top 500. It really was just a dream but the reality up to this point seemed to point to me achieving it. And so many messages from you to encourage me to do this. So while I’m happy to have finished the MDS it’s tempered with disappointment. And so to the day…. Another marathon I’d cut holes in my trainers to make it easier to get my feet in with the tape wrapped round them; even then it was a battle and so was the hobbling I could barely do just to get to the start line. As my feet warmed up the level of pain seemed to reduce and there were times in the first half where I managed to run for a while. We have been taught to look out for the signs of dehydration and between CP2 and 3 it became obvious to me that I was developing them. I was nauseous, couldn’t drink, lost my sense of balance and just got into a bleak place. I remember getting into CP3 and the dr immediately saying I needed help. So they added salt to my water, gave me some tabs and asked me to rest.. The last bit I refused. The dr looked me very deeply in the eye and made me solemnly promise I would drink regularly. I did and in time felt better eventually after what seemed forever I got in to the finish. Not making excuses just telling it as it was. At the end it was back to doc trotters for my feet to be resorted …. The drs comment was ” your blisters have been breeding ! ” My ankle had ballooned as well. Anyway enough of all that! Coming over the last hill you could see the camp 2kms away. The feeling of elation that I was so close. I remember shouting “yes” and exchanging big smiles with a Japanese competitor near by. An organiser standing by laughed and said “only 2 kms until you get kissed by a Frenchman!!”. As always Patrick Bauer was there to welcome everyone back with a hug and a kiss on both cheeks and to hand out the medals. All my tent mates were back and I bumped into some of them as they were coming to the finish to welcome me back. You are a great group and I’ve made some good friends this week! The evening was the medal ceremony followed by opera de Paris playing sumptuous music under a star filled sky surrounded by people who had all suffered in similar ways. A very special night. The final day is a 7 km walk with us all wearing a blue UNICEF tee shirt to show solidarity for children and the prevention of violence towards them. It was a morning unlike the others. The start felt more leisurely and there was so much banter flying around the tent and the wider camp. In addition to the water collection we needed to also collect a blue t shirt. Today’s leg was not timed but rather a show of solidarity in support of UNICEFS work against violence towards children, and we would do this by walking as a long group of 900 (over 100 had dropped out) across a 7 km course to the finish line. Patrick Bauer once again went for a lengthy talk at the start but I think this time misunderstood the vibe of the crowd. He’d got into the habit of getting the music “happy” played and asking us to dance to it ! I don’t think many were physically capable!! Finally the music revved up to “highway to hell” and the helicopters started there adrenaline rushed very low passes over the crowds and I mean low…perhaps 10 metres!! Lots of flags flying and everyone went their own pace, tent 110 stuck together and we passed the time sharing memories of the previous week or at times quietly reflecting to ourselves. Eventually we reached the outskirts of the town (I have no idea of the name!) where the finish line was set up. As we got closer the older kids came out to meet us and were cheekily asking for anything they could lay their hands on! They would have taken the bags off our backs if they could! Closer to the town were the little kids with their parents and all of us were looking for something we could give. I’d been carrying around a packet of playing cards all week, which were never used and I’d forgotten about them. Luckily Chris remembered so they got given to a little tot who had no idea what he’d been given but I’m sure will be the envy of his friends!! At last the finish line appeared with lots of people cheering and clapping and tent 110 formed a line and we went over together. Through the admin of handing back the transponder and the safety flare and we were then given half a flat loaf of local bread and a packed meal for the coach journey. The bread was incredible. Having eaten nothing but mush or power drinks or processed for all week the texture and taste was so good. We wandered over to the buses for the 4 hour drive to Ouzzazate. Once on the bus I quickly ate everything in the bag and then slept most of the journey. We arrived at the hotel; a bunch of smelly (and I truly mean we stank to high heaven), dirty, tired refugees all dressed in our bright blue UNICEF tops. A massive queue to check in that stretched out into the street. Gerrit announced he was going to get some beers. He wandered around neighbouring shops and not finding anything he asked someone stood nearby. All our jaws dropped when this lad climbed on his moped shortly followed by Gerrit on the back!! They disappeared for 10 mins and Gerrit returned with a big grin on his face on the back of the moped clutching a plastic bag filled with bottles of beer!! He’d promised the owner of the moped his blue t-shirt for his assistance. Checking in over, allocation of rooms and then a shower. Oh boy what a shower!! Good to feel clean again. Tent 110 met in the bar and it was hard to recognise one another or other runners for that matter!! A few beers later, and only a few…it was all we so could cope with, and after a wonderful buffet meal at 8:45 none of us could keep our eyes open and the day ended there. And so the week came to an end. Some more admin stuff was still to be done but the bubble in the desert had burst. To be honest you had to be there to really understand what it meant to be there and what a big change moving back to the real world. All through the week Berbers at the camp, or waiters in the hotel would end any sentence with Insha’Allah. “Today will be a good day, Insha’Allah” or “you will have a good run today Insha’Allah”. It feels fitting to say that we succeeded in the desert, never beating it – not even taming it … but we achieved our goal … Insha’Allah. 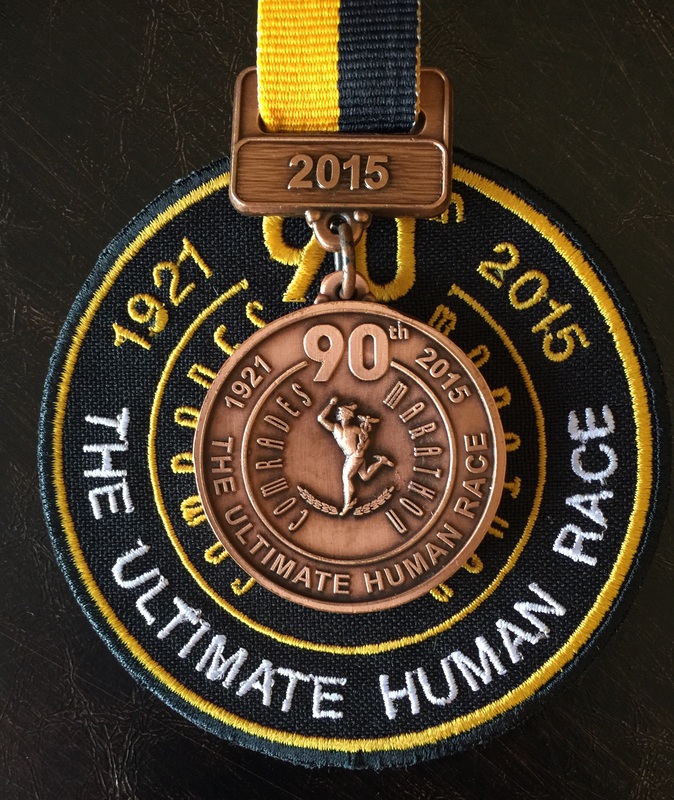 The Marathon des Sables – they don’t call it an ultra-marathon for nothing.